Song repertoire from 100 years proves useful! 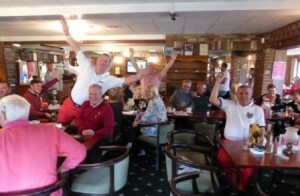 Golf Club goes wild…. Home » Song repertoire from 100 years proves useful! Golf Club goes wild…. I play a variety of gigs for all age groups when I am out solo and my repertoire has expanded over the years to include songs from the 1920’s, 30’s and 40’s right up to contemporary artists such as Ed Sheeran and George Ezra. This can come in very useful when I’m booked to play a function or at a Vic’s Jukebox song request night and I can throw in some songs people wouldn’t necessarily expect. 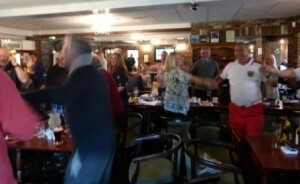 This happened on Sunday when I played at Upchurch River Golf Club in Kent for a St. George’s Day event. After a background set whilst they were dining I managed to get the audience to enjoy a number of singalong songs such as London pub songs, I Would Walk 500 Miles, Delilah, Hey Jude, You’ll Never Walk Alone, American Pie and others. “I wanted to make our St George’s Day celebrations extra special this year. 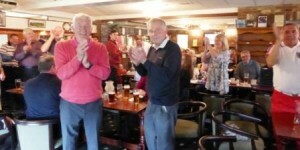 I wanted people singing and having fun, that was all achieved thanks to the company of Vic Cracknell, who had the whole bar singing and buzzing. Thanks Vic for a great afternoon and look forward to seeing you again soon at Upchurch River Valley GC “. I am available either solo or Vic Cracknell Party Band for Functions, Parties, Corporate Events, Weddings and Clubs across Surrey, Hampshire, Berkshire, Middlesex, Sussex, Kent, Dorset and London.